Have a butchers at this important campaign which is aiming to promote and keep open all our favourite digging spots that we’d be lost without. Forget the wack range of chart music at your local supermarket and don’t even think about going to a super store on the high street when you fancy buying sounds. It’s all about the independent record store. Here’s a place which will meet all your needs. You’ll find a far more interesting range of stock, beyond what’s ‘hot’ and the latest thing the corporate monsters want to stuff down your throat. And, if you have a question, something along the lines of ‘Did Kanye really produce ‘Hiphop’ by Dead Prez?’ or ‘So who are those Sa-Ra guys?’ you’ll get an answer, rather than a vacant student shift worker responding with ‘You don’t need to know. What you need is this new Chico wax’. 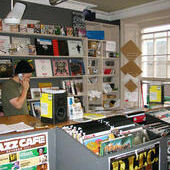 The independent record store is a place of atmosphere. There’s no huge displays brainwashing you into taking something off a shelf, and there’s no huge projector screens morphing your mind into becoming a fan of the Pussycat Dolls. There is on the other hand, crates full of wax which represents the wealth of a genre rather than the wealth of influence record companies hold. Put plainly, your local record shop has more soul than the cheque’s multinational music industry big wigs sign to secure favouritism with product managers for nationwide chain stores. 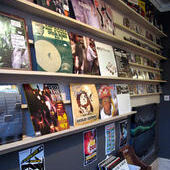 Wyt-Fang of the Underground Alliance crew and Filthy Habits record label took the dope step in 2005 to take his established online record shop to the street. Whilst local shops closed their doors all over the UK, he bravely opened Headnod Records at 17 Chalk Farm Road in Camden, North London. Like many existing independent shops, it quickly became a reliable and celebrated spot for those in need of their thirst for hiphop to be quenched. 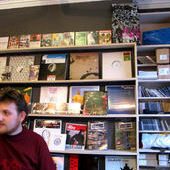 Wyt-Fang now leads the ‘Save Your Local Record Shop’ campaign, an initiative aiming to increase the profile of shops nationwide, of any genre, in order to improve their chances of survival and insure they don’t become extinct. A website is currently under construction and the campaign is about to go on a militant media blitz. Flyers, sticker’s etc will be doing the rounds on the nation’s walls and other methods of showing your support will become clear soon. To get in touch with Wyt-fang, drop him an e-mail at [email protected] and contribute to the life line of independent record stores of all types, whom have and continue to be extremely important aspects of the genre’s they specify in. Nice to hear about the campaign – a little late for my (now defunct) emporium! does Dan Radcliffe ever come into the head nod?